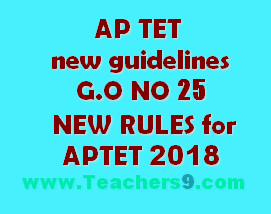 AP TET new guidelines - G.O NO 25 - NEW RULES FOR APTET 2018. Government after careful examination of the proposals of the Commissioner of School Education, Andhra Pradesh, Amaravati hereby issue the following Guidelines/Instructions for conduct of Teacher Eligibility Test (TET) as Computer Based Test (CBT) in super session of the guidelines issued earlier in this regard. (ii) Intermediate / Senior Secondary (or its equivalent) with at least 45% marks. In respect of SC/ ST/ BC/ Differently Abled candidates, the minimum marks shall be 40%. and pass in 2 - year Diploma in Elementary Education / 4-year Bachelor of Elementary Education(B.El.Ed. )/2 - year Diploma in Education (Special Education) in case of the candidates, who have passed or admitted to D.El.Ed / D.Ed., course prior to NCTE Gazette Notification, dated:23.08.2010.